The Uniform Store is located to the right of the main front entrance, behind the Cafe. *Schedule changes will be noted in the Parent Newsletter. The WRCA Uniform Store now stocks samples of all uniform pieces along with gently used items. Come in to try on the items you need, then either order them in store or go home and order/pay for them online; you have the option of picking them up from the supplier or having them delivered to the WRCA store for pick up. Bravo has updated their uniform prices as of April 1, 2019. Click Here for more information. Store Hours may occasionally vary. Please refer to the Weekly Newsletter for updates. For volunteer opportunities please contact Lyndell Richert at rlrichert@hotmail.com (Leave your name and contact info). 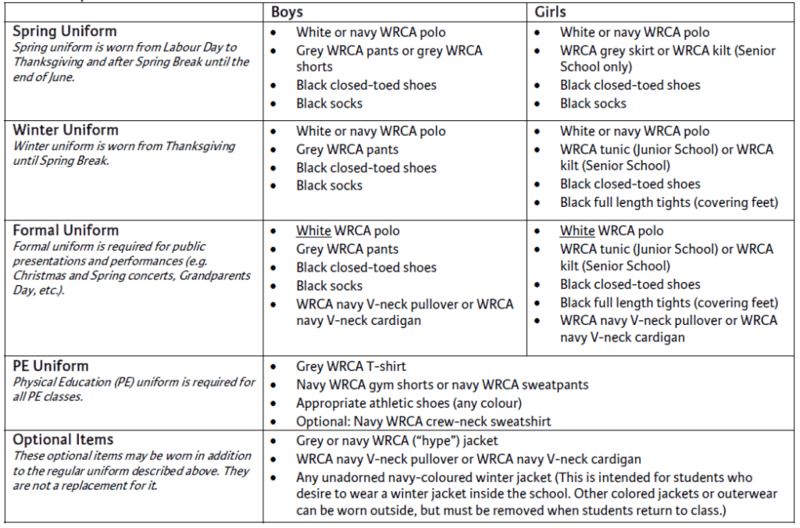 Senior School girls (Grade 6 to Grade 12) wear the WRCA kilt and Junior School girls (Kindergarten to Grade 5) wear the WRCA tunic. Skirt and kilt lengths must be a maximum of 2 inches above the knee, and bicycle shorts should be worn under the skirt or kilt. 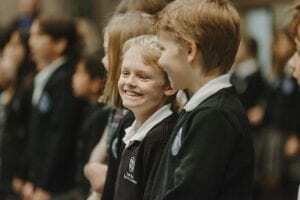 Junior School students are not expected to change in and out of their PE uniforms. Therefore, the PE uniform is worn for the whole day on the days that the student has a PE class. Pants, shorts, skirts, kilts, tunics, etc. must be WRCA uniform items. Similar items purchased from other suppliers are not acceptable. Unadorned ankle or calf-length black boots are acceptable for girls. “Uggs”, flip-flops, sandals, slippers, etc. are not permitted. Shoes should have all black uppers (including laces). Given the difficulty some parents are having in finding all black shoes, the “all black” rule has been relaxed to allow white soles. WRCA team wear (hoodies, jackets, etc.) is designed for team members to wear to and from games. These items are not uniform substitutions or additions. The only approved additional layers are the Optional Items listed in the grid above. Athletic shoes may be worn with the Spring and Winter uniforms as long as they are all black uppers (see above). “Wheelie” shoes are not permitted. Students may wear non-uniform jackets, footwear, etc. when playing outside. These items are to be removed when students return to class. Parents: Check Labels… Thanks for labeling your children’s clothing. When doing laundry, please check the labels to make sure your child has the right clothes. This is especially important after a day with gym classes when clothing can easily get mixed up. the grey hype jacket. The navy hype jacket will continue to be available. any items that have the old school logo. Labels for all school needs. Shoes, clothing, stationery, gifts and more!